Like its hero, the wall-climbing, sewer-spelunking, city-hopping Kyle Crane, Dying Light has its ups and downs and is kind of all over the map. Techland, creator of the Dead Island series, takes elements from a number of games—especially the Far Cry series—and mashes them together in its open world first-person zombie shooter. It's an uneven mix, bookended by a slow start and an exasperating finish, not to mention a few troubling performance issues, but in the middle lies a sweet spot that provides hours of satisfying, zombie-stomping fun. Kyle Crane, a secret government operative, has been sent to the city of Harran to retrieve critical data about a virus that's turned most of the population into zombies. Crane, after immediately botching his mission and getting bitten, falls in with a selfless group of survivors, contends with a vicious warlord bent on controlling the medicine supply, and takes orders from an agency superior who would prefer to simply napalm the entire mess. Who will Crane ultimately pledge loyalty to? I wonder. Crane, despite being what I assumed was a top physical specimen, initially can't run for long before slowing and gasping, and can only swing a melee weapon a few times before running out of stamina, which resulted in a slow and awkward first few hours of play. Weapons, at first, are limited to pipes, wrenches, small knives, or sticks of wood, all of which do little damage to zombies and need frequent repair before falling apart completely. The melee combat itself is a bit wonky: sometimes you'll score a staggering hit or grisly decapitation and win your fight instantly. Sometimes you'll just have to spam the mouse until you run out of stamina or your enemy falls. It doesn't feel like precise aiming helps: I've tried very hard to land my strikes perfectly, but the harmless glancing blows and devastating skull-crushers feel like they're randomly determined. Blueprints can be found or purchased, letting you craft upgrades to electrify pipes, sharpen or poison knives, add nails to a baseball bats, and otherwise beef up your attacks, and better weapons like swords and axes slowly begin to appear as you progress. Flipping through menus to craft gear tends to slow things down a bit, though provided you don't play in marathon stretches like I did, it may not be as tiresome as it eventually felt. It takes hours of play to even get your hands on a gun, and the relief of finally having a firearm somewhat defuses the issue of there being only a couple of pistols, two types of rifles, and a double-barrel shotgun. Your best weapon is Crane's slowly improving agility coupled with a city perfectly built for climbing and roof-running. Once you get the hang of leaping and climbing and realize that nearly everything in the city that looks like it can be climbed can be climbed, Dying Light opens up and becomes a fun, zombie-infested playground. Techland has done a great job with the running, jumping, climbing, and clambering—zipping up the sides of buildings, sprinting across rooftops, and dodging and dashing through the crowded streets becomes real fun, an instinctive and exciting way to travel. Skill points are doled out slowly and individually as you play and there's lots to spend them on. The vaulting skill is a useful one: while dashing through the streets you can plant your foot right on a zombie's face and launch yourself over it, leaving it in the dust. A related skill can also stun your targets as you leap off them, so you can land, turn, and bash your wobbling enemy's skull in. A fun, flying, two-footed kick can stagger enemies or knock them off perches, and a sliding kick can shatter a zed's legs. Despite finishing the main story I've still only unlocked about half of the skills available, and uber-skills like stealth kills and the ability to use a grappling hook come very late in the game. The result is a well-paced, gradual increase in skills and a character who markedly improves but never feels like some sort demigod placed on earth to smite zombies. The complete difference between daytime and nighttime in Harran is remarkable. Right, zombies! They come in a few flavors. Mostly, they're slow, shambling types, clogging the surface streets and bridges, lurking in buildings and alleys, and occasionally staggering around on rooftops, providing amusement as they flop off ledges or over balconies while mindlessly trying to follow you. There are also specials: huge, durable brutes who swing clubs or hurl hunks of concrete, spitters who barf slime from a distance, bloated blobs who scream and explode, and a handful of freshly-infected citizens who haven't lost their mobility and can still sprint and climb. Distracting them, rather than fighting them, is often the best move; firecrackers will divert zombies for the few important seconds needed to pick a lock (in a Skyrim-style minigame) or force open a door, and the city is littered with other traps like cars rigged to explode and puddles of water that can be electrified. The zombies' attraction to noise is a double-edged sword, of course. Shooting or using grenades is quick and effective, but can draw an overwhelming crowd. When night falls, the zombie game changes entirely. A new breed of zombie called Volatiles appears, and suddenly Crane is no longer the fastest thing on two legs in Harran. The Volatiles prowl the pitch-black city, and if you wander into their vision cones they pursue you at a lightning-fast pace while screeching to attract other zombies. You can set off traps or distract them while fleeing, but a single stumble usually results in a quick and brutal death. The complete difference between daytime and nighttime in Harran is remarkable, and I always find the approach of night to be genuinely panic-inducing as I hurriedly sprint for the nearest safe zone before the sun goes down. You're occasionally forced to do missions at night, but otherwise you can advance the clock to morning by sleeping in a bed. Harran itself is peppered with stuff to do, much of it familiar from other open world games. In addition to lengthy story missions, there are multipart side-quests, looting and scavenging expeditions, random encounters with hostile thugs or boss zombies, airdrop recoveries, citizen rescues, hunts for collectibles, securing safehouses, and a few timed challenges. It's all pretty standard open world fare and easily ignored when you're headed to a mission, but if you're just out for a run you'll always find something happening nearby. As for the story itself, it's a bit of a clunker as Crane, supposedly torn between his loyalties, grapples unconvincingly with his conscience despite very obviously being a complete Boy Scout. Characters are both familiar and forgettable: the reckless kid, the reluctant leader, the soullessly pragmatic government agent, and an assortment of helpless or nefarious NPCs. Of course, there's the evil boss who executes his henchman for minor infractions and taunts you over loudspeakers as you infiltrate his headquarters. At one point, after you slip from his clutches because he wanted to deliver yet another monologue instead of just killing you, he even raises his face to the sky and howls "Craaaaaaane!" Classic. Considering the formulaic story and the uninteresting characters telling it, I appreciate that Techland let me skip through cutscenes and speed up conversations by tapping the spacebar. That said, Dying Light also contains a series of my personal gaming no-nos. I was stripped of all my carefully collected and crafted weapons and dropped into an deathmatch arena not once but twice. There's no manual or quick saves, only checkpoints, and while they worked reasonably well for most of the game they were mostly absent for the final story mission in a cheap attempt to make the endgame more challenging. A lengthy dream/hallucination sequence, shamelessly ripped from Dishonored's Outsider sequences, slowed my movement to a crawl to forced me to listen to some truly terrible voiceovers. Finally, it made me engage in a stupid QTE-based knife fight with a boss when I had a full load of guns, grenades, and molotov cocktails stuffed in my pants. Reviewed on: Windows 7, Intel i7 x980 3.33 GHz, 9 GB RAM, Nvidia GeForce GTX 960. My PC hovers closer to the 'minimum required' end of the specs, and after some very smooth intro missions I was only averaging about 25-35 FPS when turned loose in the city. Turning down my view distance slider helped (and didn't particularly affect the way the game looked other than some occasional late texture pop-ins), and turning off vsync was also necessary. After that, I would generally hover between 50 and 70 FPS, though I regularly experienced sudden framerate dips and drops that didn't seem connected to anything in particular. I played a couple hours of co-op, which allows friends to drop in and out of each others' games, team up for missions, engage in competitive challenges, or just run around and bash zombies together. It was fun, though my co-op partner and I both experienced some very heavy lag at various times. I also tried out a couple sessions of the multiplayer Be The Zombie mode, which pits a group of human survivors against a player-controlled uber-zombie who stalks them through the city, but it just feels like a half-baked version of Left 4 Dead. 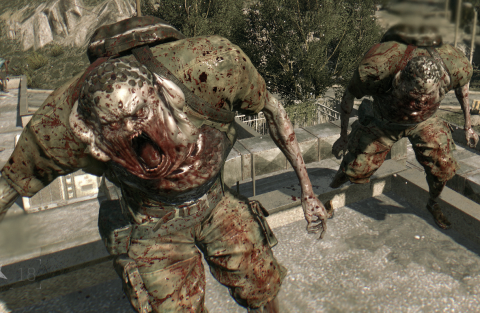 The lag we experienced was hardly Dying Light’s only technical problem. I experienced framerate dips (see the ‘Performance and Settings’ sidebar), as well as issues in cutscenes. When a scripted scene or a conversation with a character began, the visuals would completely freeze, sometimes for as long as fifteen seconds, while the audio would continue to play. Then the audio would freeze while the visuals struggled to catch up. I eventually found that simply turning off depth of field fixed it, though I have no idea why. I've also seen various reports on forums about the game not being optimized for SLI, to the point that playing with two cards is somehow worse than playing with one. If you're on the fence about buying Dying Light, you may want to hold off to see if patches make any positive changes to the situation. When it wasn't tripping over its own feet—be it from technical problems or the shambling start and potboiler story—I enjoyed Dying Light. Over the three consecutive days spent playing it almost constantly, I typically came away having had a pretty good time. There are frustrations here, but there’s also an exciting movement system and a healthy if familiar list of activities to engage in. Zombies: I bet you can't burn just one. Standard zombies are slow on their feet but quick to grab. Also, no sense of personal space. An electrified puddle can clear the streets without getting yourself messy. Good loot in those police vans, if you can keep those zeds occupied. The true test to find out if zombies feel pain. Nice to meet you. Now please shut up. I'll drop my stick if you'll put down, uh... both of your arms and legs. Fair?